IT�S ALWAYS easy to practice certain shots or skills that you�ve mastered. If you�re particularly strong playing position with a ball on the rail, for example, it�s not much of a challenge to stay sharp in this area. But one of the most important aspects to becoming a complete pool player is self-assessment. You have to be honest with yourself � and honestly approach your strengths and weaknesses. While it�s great to maintain the well-developed aspects of your game, it�s perhaps more important to improve on your weaknesses. If you know there�s a certain skill � long, straight-in shots or drawing the cue ball, for example � that is especially challenging for you, work on it. Customize your practice schedule and drills to focus on problem areas. A common problem I see in many players is when someone lets a particular shot screw up her stroke. Constantly struggling with something can start to erode your confidence � and at that point, the problem is bigger than it needs to be. Luckily, there�s a simple way to take a great diagnostic check on your game. Shoot 10 racks of balls. In doing so, make note of specific shots that cause trouble. When you see certain things bothering you on a regular basis, you know it�s something that needs work. For example, what if you notice problems when you have to send the cue ball across the table? Take a look at Diagram 1. Here, you have a long position play from the 8 ball to the 9. 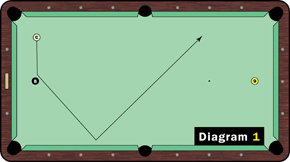 Set this shot up as shown, where you�re going off the bottom rail and into position for the 9 ball in the bottom right. Once you get a hang of this, experiment with other paths to position. Can you draw the cue ball back off the top rail for a makeable shot on the 9? With ball in hand, can you find a way to pocket the 8 ball in the bottom left and the 9 ball in the top right without hitting a rail? Be creative when addressing your weaknesses. Sooner than later, you�ll see that those tricky shots aren�t bothering you all that much.